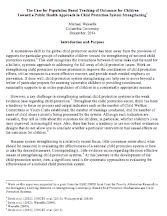 Strengthening child protection systems promises to improve the coordination of child protection efforts, to utilize resources in a more effective manner, and to provide much needed emphasis on prevention. However, a key challenge of this work is the weak evidence base regarding outcomes for children – in particular, whether children's lives have improved in meaningful ways. This paper by CPC faculty affiliate Mike Wessells suggests the value of tracking population-based outcomes for children as a key component of monitoring and evaluating the effectiveness of a national child protection system and considers what indicators and outcomes are most appropriate for tracking at a population level.